Don’t let the Roman numeral V mislead you, Lady Kathryn V is as personal and unique as her owners wanted her to be. 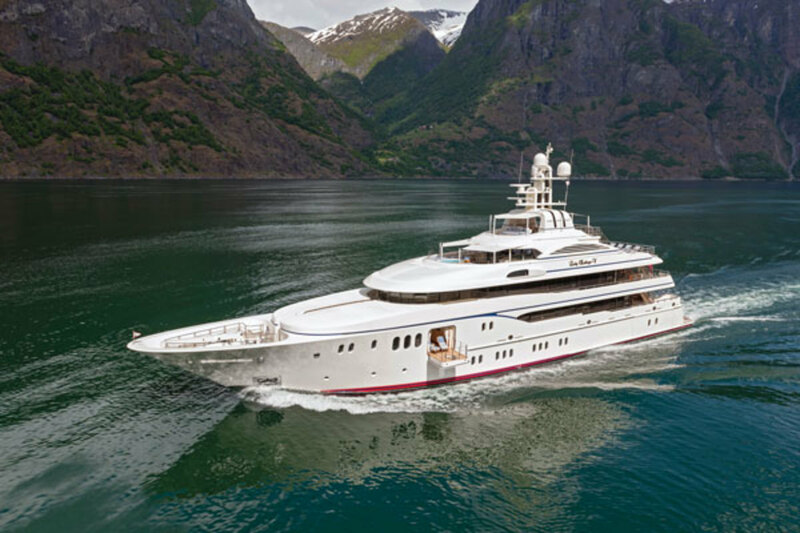 This 196-foot (60-meter) Espen Øino-designed Lürssen may share similarities with her Lürssen predecessors, built on the same naval platform, but she claims several unique features, including the first skydeck and fold-out balcony seen in this series. She owes these distinctive features to her hands-on owners. “Partnering with experienced owners, who know what they want, is always a pleasure,” says Lady Kathryn V’s interior designer, Adam Lay. Working from his office, based in Hampshire in the south of England, he collaborated closely with the owner’s family of four and their chosen decorator, Jack Fhillips of Palm Beach, Fla. The design process produced ever more intricate drawings to meet the owners’ detailed vision for a family yacht that could entertain guests in grand style, even at the dock. 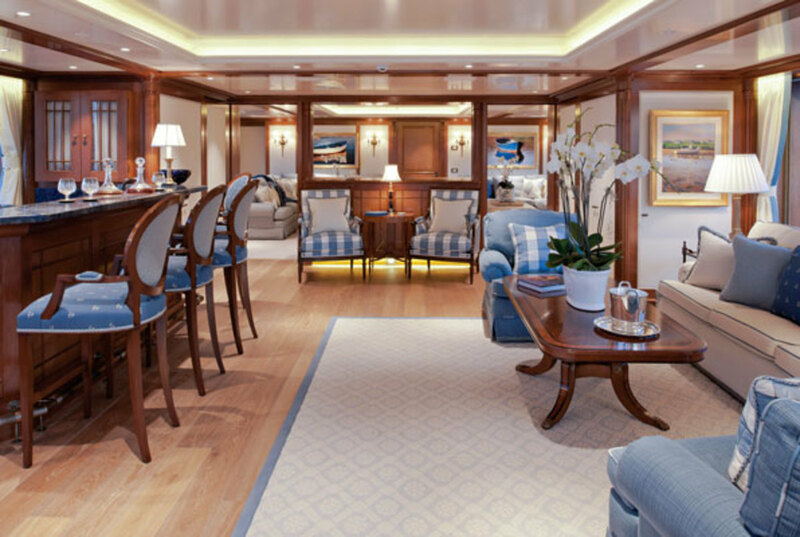 Lay’s detailed renderings specified every stowage space for the yacht’s extensive collection of table linen, porcelain, glasses and cutlery. 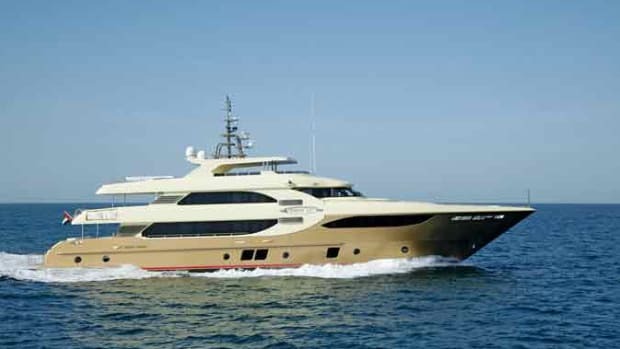 The owners were complicit in every phase of the yacht’s construction, frequently visiting the shipyard in Germany, where the yacht was taking shape, and the interior outfitter Greenline in Dubai, responsible for the detailed raised panels and arches meticulously designed by Lay. The designer, who went to the owners’ home to familiarize himself with their lifestyle, quickly realized he was dealing with passionate connoisseurs of antiques and objets d’art. Period pieces fit right in with warm fruit-tree woods the owners wanted for the interior. Walnut and oak rule the roost, but the yacht also features carved panels in anigre with a veneer and finish that matches the books on the library’s shelves. The whole ensemble conveys a sense of elegant informality. Fhillips, who selected the accessories and fabrics with the owners, opted primarily for light maritime colors that provide a pleasant contrast to the wood’s honey hues. Features from historical homes inspired a couple of the yacht’s most outstanding features, such as a Georgian-style mirrored window that extends two decks up in the foyer. Chatsworth House in the English county of Derbyshire provided the inspiration for this structure, which allows natural light to shine into the inner part of the stairwell. 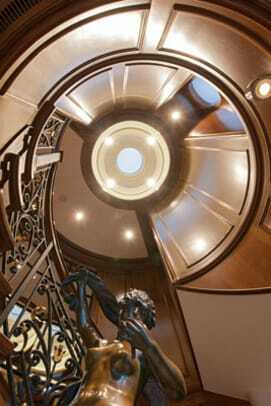 The stairs linking the lower, main and bridge decks spiral around a bronze statue that stands on an onyx plinth, greeting guests as they enter through the starboard entrance. Gold-plated banisters and a compass rose emblazoned in the stone floor complete the vision. A bar, columns and arches frame the entrance to the salon. Completing this inviting showcase is a baby grand Steinway piano, which one of the stewardesses plays beautifully for the guests. The adjacent dining room is large enough to provide top-of-the-line hospitality or to accommodate private meetings. The Chippendale motif found in the main salon recurs in the owners’ salon, part of a large suite with a balcony, an office and his-and-hers bathrooms. On the bridge and skylounge deck, the owners came up with a great solution for a dual-purpose space. Sliding doors can close off the cinema room from a conversation area, allowing children to watch a movie, while adults chat in the adjoining room. The sun deck with wellness suite, sauna and shower, hidden behind mirrored windows, is loosely modeled after the Orangerie in London’s Kenwood House. It is topped by a skydeck, a quiet retreat with great views and shade. 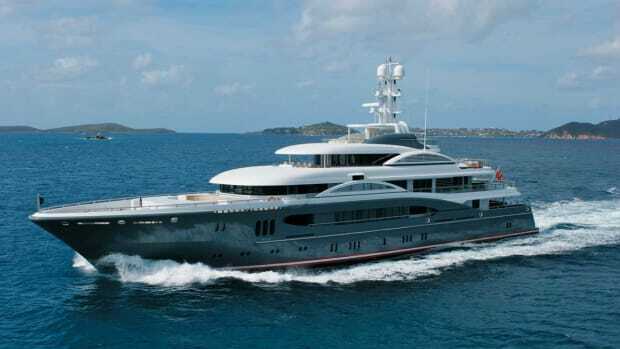 Since delivery, Lady Kathryn V has cruised the Mediterranean, the Norwegian coast, the Baltic and the Bahamas. 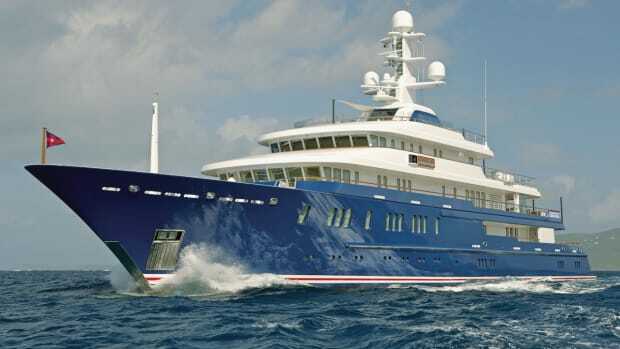 As with their former yachts, the owners will sail the seven seas out of their homeport of Palm Beach where their latest ocean cruiser looks perfectly at home. 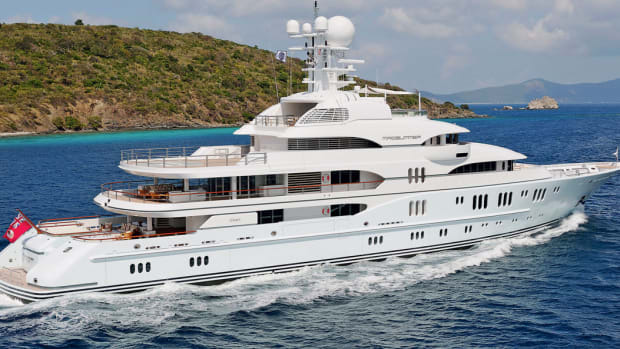 Lady Kathryn V’s owners wish to maintain their privacy, so in this interview we refer simply to the “owner.” In fact, there are four owners, Mr. and Mrs. and their two adult sons—all equally involved in the evolution, development and build of the family yacht. 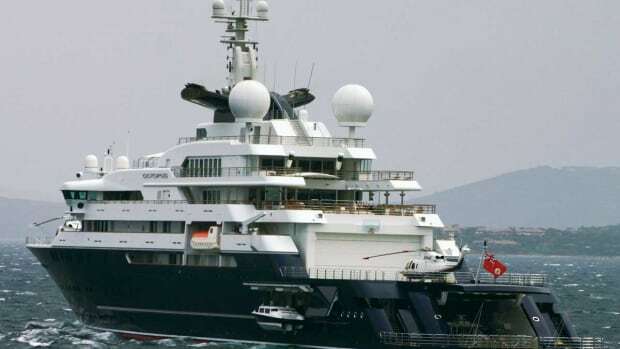 Jill Bobrow: The numeral V indicates you had yachts before this one. What were your earlier yachts? Owner: We first had pre-owned yachts. In 2000, we bought a 102-foot Broward, sold it in 2002 and purchased a 113-foot Broward, which in turn we traded for a 144-footer built by NQEA. We modified all three to suit our taste. However, we knew that to get exactly what we wanted, we would have to build a new yacht. Westport had a 164-foot yacht under construction that we could have assumed, but instead we decided to build from scratch. After having made compromises on our earlier boats, we simply knew what we wanted for Lady Kathryn IV, our Westport. We traveled 25,000 with her and had several successful charters. 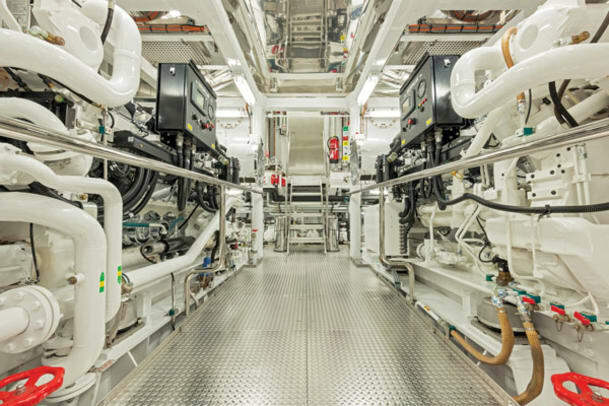 What drove your decision to build at Lürssen next? Our longtime captain, Chris Ramos, had a long-standing relationship with designer Espen Øino and he recommended him to us. Perhaps it was a combination of Øino and our brokers, Robert Moran and Kevin Callahan of MoranYacht & Ship, who procured us a slot at Lürssen and helped us make this decision. 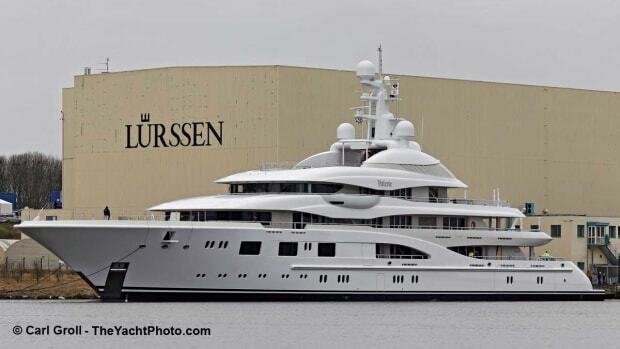 Naturally, we already knew of Lürssen’s reputation for excellence. We feel we made our mark by adding design elements that did not exist on the previous six 60-meter Lürssens (Capri, Oasis, Linda Lou, Vive la Vie, Arkley and Solemates). What were the special enhancements you made? Lady Kathryn V has the longest LOA in the 60-meter series and boasts the largest volume by far. Øino totally restyled the exterior, which afforded us an additional deck—a skydeck under the mast arch. We also wanted walkaround decks on the bridge deck. 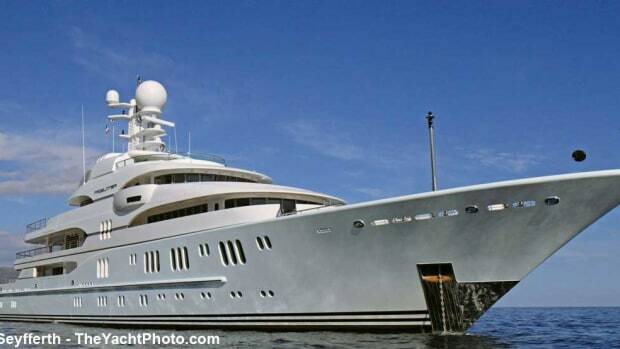 We extended the bow and the swim platform, stretching our yacht to 61 meters. We finished our tender garage to such a high level that it is like a beach club. 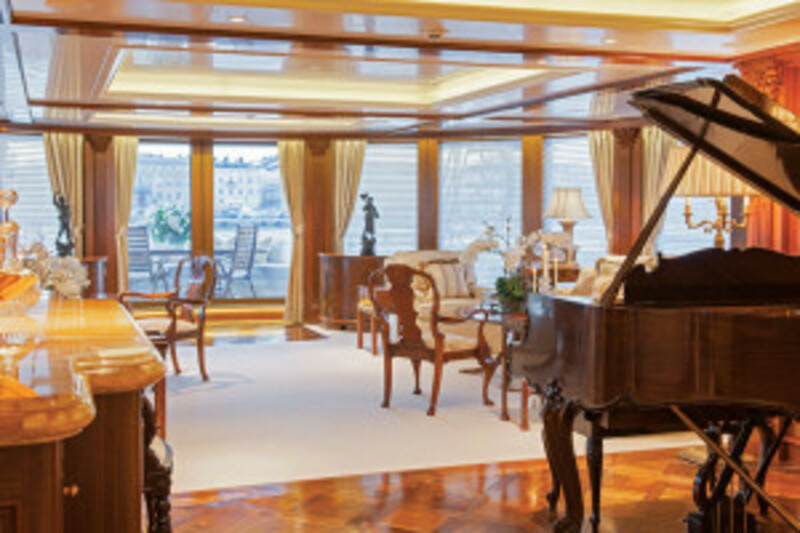 We have the only Lürssen in this range with a fold-down balcony off the master stateroom. Then there were several interior decisions we made with our interior designer, Adam Lay, which set her apart. What inspired the interior design? We have long admired certain fine English homes and incorporated some of their iconic design features, such as specific wood paneling and coffered ceilings, into our grand plan. We also admire the British sense of formality, and our yacht has various antique accent pieces. 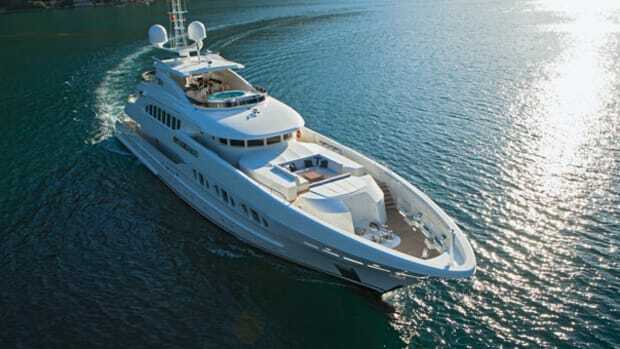 However, we wanted the yacht to be livable and comfortable. Interior designer Jack Fhillips, who has been involved in our homes, helped us with fabrics and textiles. In the end what we wanted were many different intimate spaces so that when we had a boat full of guests, people could either come together or disappear. Also, as we like to entertain, we needed ample storage for place settings and cutlery. In fact, we ferreted out storage in every nook and cranny possible. 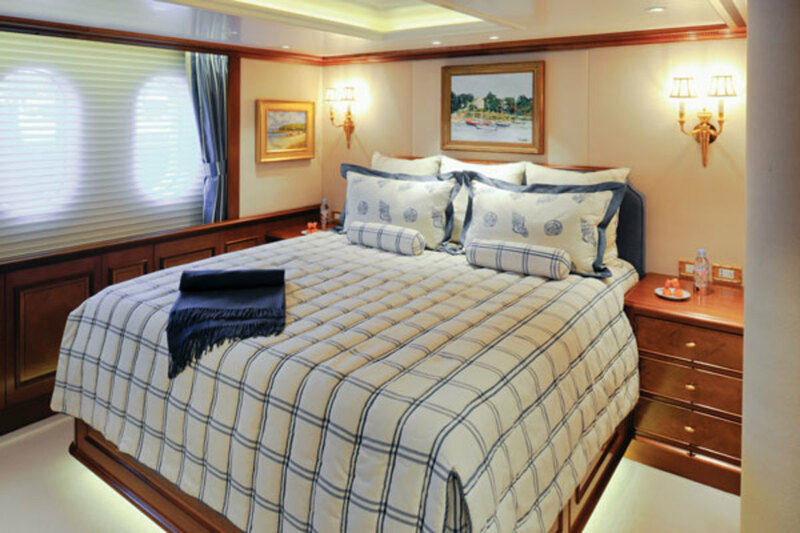 Even the amount of hanging closet space was key, as we like to leave our belongings on board during a charter under lock and key, and still afford ample closet room to charter guests. How much time do you spend aboard? We particularly enjoy spending a few weeks cruising in the spring and the fall; we leave the peak season of summer or winter to charter guests, but as the yacht resides at our dock, we can use it spontaneously for entertaining or parties whenever we like. What is your favorite cozy corner? It all depends on the weather. We like to be outside as much as possible, but not in the direct sun. We specified overhangs or awnings everywhere. We enjoy the sun deck forward near the Jacuzzi for breakfast, the aft bridge deck for lunch…Really, we have so many places, depending if it is just the two of us or if we are with our sons, and family or friends. As hands-on owners, do you enjoy the process? Very much. 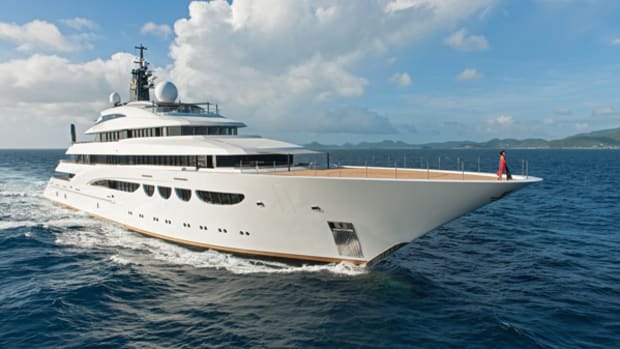 I think if you asked Lürssen, they’d probably tell you we were the most involved owners they have ever experienced. All in all, we are an enthusiastic yachting family.